Tomorrow at 8AM, I will be working my first eight hour shift at my first job! Haha well it’s kind of like a “temporary” job. I applied for a job at a pharmacy/convenience type store called Shoppers. There was one near my house, and they built a brand new large store right beside the old one so they put up signs to say they were hiring! When I submitted my resume, I basically got called to work a week after. The contract said that I was going to be hired for a month (along with many other people who applied). At the end of the month, they would offer positions out to people they thought were fit for the job. Idk, I really hope I get it. This is my first job, so I don’t really know what I’ll be doing. I suppose stocking shelves or something like that. Easy stuff, hopefully not too much heavy lifting! So, tell me about your first job experiences! What was it like? Any tips? Also, LingLing has developped a really weird habit of sitting by the bathtub and watching the faucet drip. She literally sits there for hours. 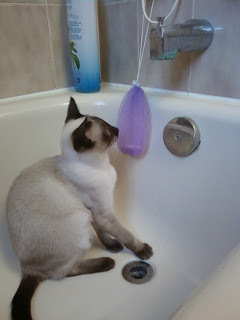 And when the water falls, she tries to attack it.